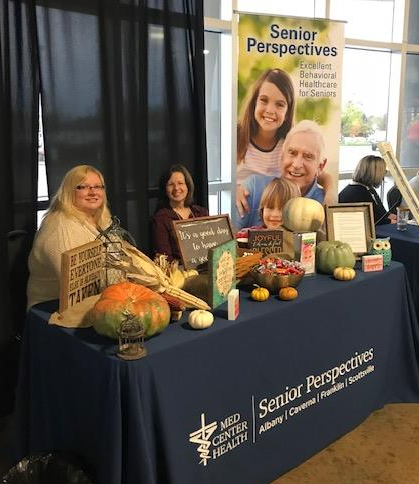 Senior Perspectives staff from Franklin, Scottsville and Albany attended the 2018 Mental Health and Aging conference that was held at the Corvette Museum on Thursday, October 25th. Senior Perspectives was a Gold Sponsor for the event in which 225 people attended. Topics at the conference this year included Suicide prevention, Guardianship issues, Crisis intervention, Polypharmocology and Self care. The Bi-annual Networking Luncheon for the Northern Illinois region met on Friday, October 5th to share ideas and information. The topic for this luncheon was discharge planning. Staff from all the participating IOP programs were able to share information & tools they use for documentation, Continuum of Care Coordination, Communication with Primary Care Physicians, and Post Discharge Follow up. Gibson Area Hospital, senior health fair in Bloomington, Illinois.